Join the ladybird for another adventure. Julia Donaldson gave herself a really hard act to follow with The Gruffalo - on Amazon UK this has over 1,000 reviews and an average of 4.9!! Both my grandchildren love it and their parents already know it off by heart. 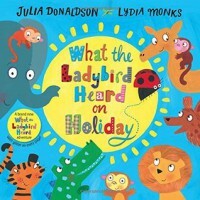 So it was with high expectations that I requested a copy of What the Ladybird Heard on Holiday from NetGalley. I gave this a run-through and found the rhymes a bit awkward, so I borrowed it's predecessor, What the Ladybird Heard, from my grandson, to compare them. To my delight, I discovered that in the paper copy of the book, the ladybird has texture - so instead of saying 'where's the ladybird' on each page of my review copy, my son was directing, 'touch the ladybird', which is already so much more fun. But I also found that the rhyming in the original copy takes a few reads to get the hang of, to get the rhythm right. What the Ladybird Heard on Holiday is intended for a slightly older audience (3 - 6 years) than The Gruffalo (2 - 5 years), so my grandchildren are still a little young for it, but they loved the animals and will get more involved with the book as they understand the story better. I may be giving this one 4 stars, based on the slightly awkward rhyming, but it's still an excellent choice for all young children.